It feels like the last few days have been tough in some regards, but I must admit that embarking on this challenge has brought a certain zing into my culinary life. While it has closed some doors for a while — notably on the bread front, which I’ve whined about probably more than I should — it has opened others. Discovering coconut flour has been worthwhile, and not something I would have known existed otherwise. I haven’t used it in a big way, not yet, but when I opened up the package and took a whiff, it smelled so pure and well, coconutty, that I felt instantly transported to a tropical beach, cool drink in hand and sand between my toes. Realizing that almond meal is a pretty decent stand-in for all purpose flour, at least in something with a heavier texture like muffins, is pretty cool as well. Thank goodness I’m not allergic to nuts, or Paleo-friendly baked goods would be that much more challenging. Eve, your squash pancakes with smoked salmon and cream cheese schmear were such a treat tonight. A squeeze of lemon, some capers and chives on top…very tasty. I should come over to your place for dinner more often, especially if you’re serving bubbly. From Paleo Comfort Foods by Julie & Charles Mayfield. Preheat oven to 350 degrees F. Spray a muffin tin with olive oil or coconut oil. In a small frying pan, heat 1-2 teaspoons of coconut oil over medium heat. Saute the mushroom and shallots for 3-4 minutes, or until shallots have softened and mushrooms have cooked down. Place one slice of ham in each cup. Put a few tablespoons of the mushroom-shallot mixture in the bottom of each. 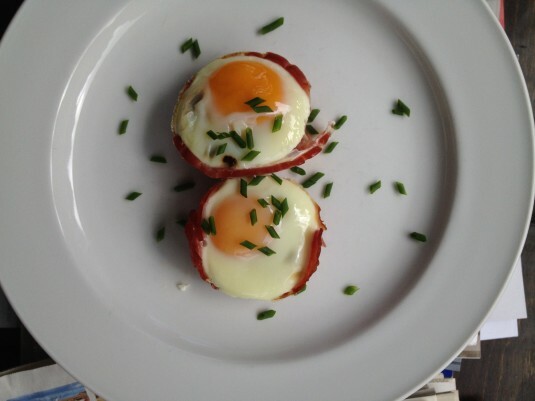 Crack an egg into each ham cup. Cook for 15 to 20 minutes (depending on how you like your egg). Garnish with fresh chives, if using. oh those look lovely. might have to check out coconut flour, sounds wonderful! Jeff, these eggs were very tasty. And they have a portability to them that could come in handy. I think next time I might try doing the eggs whisked together, although the picture probably wouldn’t be nearly as pretty as this one. Wow, this looks great — gorgeous photo, Jeff. And a little more ’rounded out’ too….those plums look delicious.